In a sunny room at the Adult Day Program in Colchester, Harka Rai sat hunched over a coloring page. The 81-year-old Bhutanese man had colored the central floral design red and blue and was moving on to a different section of the page. His wife, Dhan, sat next to him. She, too, was engrossed in her own work. The couple is among the eight Bhutanese senior citizens who attend the adult daytime care program, which the Visiting Nurse Association of Chittenden and Grand Isle Counties launched in 1981. 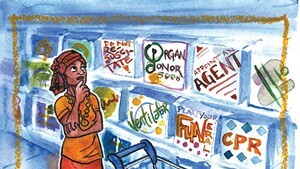 Participants have frailties and functional needs in some of their daily living activities. On average, 18 to 24 people visit the VNA's premises in Colchester each week, said site manager Donna LaFromboise-Perretta. The Bhutanese aren't the only immigrants participating in the program. 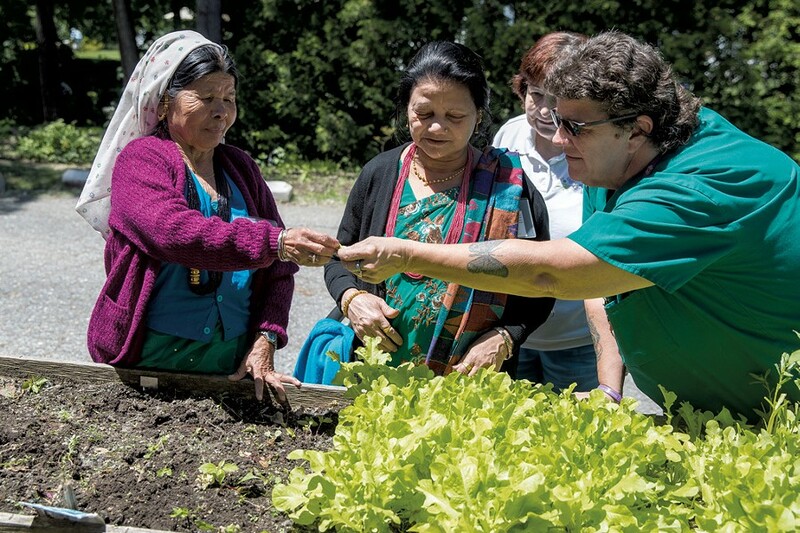 The Colchester site also serves clients born in Bosnia and Iraq, but the number of Bhutanese elders enrolled in the program has grown in the last seven months. That increase can be attributed to the efforts of Khara Neopaney, a case manager at Age Well. The Essex-based nonprofit provides support services to aging Vermonters in Addison, Chittenden, Franklin and Grand Isle counties. "People come for different reasons," explained LaFromboise-Perretta, who has worked at the Adult Day Program for 25 years. "They might live alone and need socialization, or they might live with a family member who has to work, and so they are not fit to stay home alone." Months after Rai resettled in Vermont in 2014, he suffered a stroke. "I used to stay inside the house," he said through an interpreter. "I feel that I cannot go anywhere due to the snow." 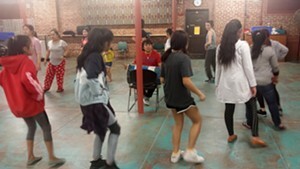 But, like many seniors, Rai found it difficult to remain inactive. In Bhutan and Nepal, he had been an astrologer, farmer and Hindu priest. He was also a dhami-jhakri, or "jumping doctor," who performed rituals to heal the sick. 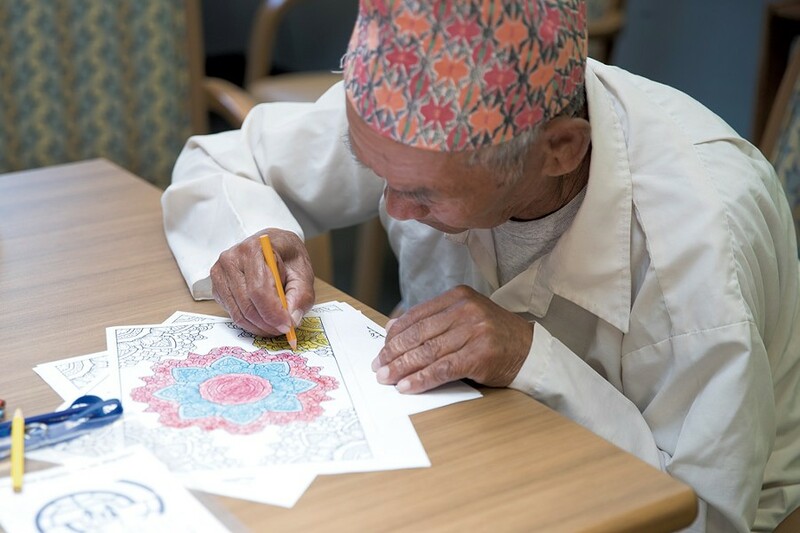 At the Adult Day Program, Rai's favorite activity is coloring, he indicated. "We know there's a big population that needs Adult Day, [and] we know there's a great Adult Day Program," said Rachel Lee Cummings, Age Well's chief operating officer. But the Bhutanese senior citizens weren't utilizing the VNA's program because of cultural barriers, she noted. "[Neopaney] has been the main person to increase [participation in] VNA Adult Day [by] the refugee community," Cummings said. The program is "a great thing" for Bhutanese senior citizens, Neopaney agreed. Not only does it give caregivers — most of whom are family members — respite, or allow them to go to work, it also gives the elderly an opportunity to engage in social and recreational pursuits. These activities are crucial to their mental well-being; many of the Bhutanese don't speak English and typically rely heavily on their family members. "When I see them at home, they're always depressed," Neopaney said. "They keep watching the TV." In contrast, the elderly were always occupied with work in Bhutan and Nepal, the case manager continued. "They didn't have a chance to lie down and sleep." But Neopaney hasn't found it easy to convince his clients of the benefits of adult daycare. Most Bhutanese senior citizens "don't want to get out of their house and get involved with other people," he said. In addition, the elderly aren't accustomed to eating outside the home nor eating food that isn't prepared by family members. "It's very difficult to change the old mind," Neopaney conceded. Besides the cultural barriers, he has had to face bigger institutional barriers. Transportation is a huge challenge. It isn't uncommon for Bhutanese adults to work a night shift and sleep during the day. Hence, they're unable to drive their elderly family members to the program site in Colchester. The onus is on Neopaney to convince the Special Services Transportation Agency that his clients are eligible for rides provided by the nonprofit. He revealed that one of his clients was denied transportation three times because of mistaken identity, and it took considerable effort to resolve the error. However, Neopaney said there's great satisfaction in seeing changes in clients who participate in the day program — even if adjusting to the new environment took time. Now, not only do they make an effort to dress up, they partake in activities. 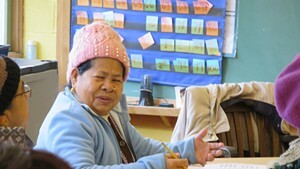 Man Pradhan, 73, was one of the first Bhutanese elders to attend the Adult Day Program. His son, Kamal, had heard about it and signed up his father in early 2015. "As my wife and I both work, he was left alone in the house," said Pradhan, who is employed at the Howard Center. "He needed help with socialization, as he was undergoing depression and anxiety." But the transition wasn't easy for his father, Pradhan admitted. "In the beginning, for almost a year, he struggled to adapt to the program because of the lack of communication with his peers [and staff] at the daycare." His father felt lonely and awkward, Pradhan said. "At times, he refused to go to the program because he was the only Nepali-speaking client." Things improved when more Bhutanese were enrolled. These days, Pradhan said, his father "feels more adapted and likes to go to the program without hesitation." Site manager LaFromboise-Perretta said that the elder Pradhan took other Bhutanese seniors under his wing when they first arrived. According to Pradhan, many Bhutanese immigrants like his father "have lost [their] sense of connection to the world." In Bhutanese and Nepali societies, social gatherings are common, and people visit their relatives and neighbors without notice. In Vermont, this practice has become less common because of the language barrier and lack of transportation. In addition, families may not be able to give their elders the help or attention they need because they're busy working. And they may not recognize the signs of depression, Pradhan explained, adding, "I would recommend this program to all folks who are struggling." But both he and Neopaney agreed that there's room for improvement at the Adult Day Program. For example, the Bhutanese certainly want to see more of their culture in the program's activities and menu. "My father would love to watch religious Nepali or Indian movies or documentaries once in a while," said Pradhan. Indeed, a volunteer once played a Nepali song, and the older Pradhan couldn't stop dancing. Neopaney said the most common feedback from his clients is that they wish they could be served Nepali food. The participants would also benefit more if there were a Nepali-speaking staff member. Neopaney shared that his predecessor had enrolled a couple of Bhutanese senior citizens in the program, but they stopped attending after feeling frustrated by the communication barrier. VNA management agrees: "We need help integrating them with our group as well as our group integrating with them," LaFromboise-Perretta said. The original print version of this article was headlined "Aging Together"